This is a great option if you are getting married next to the water. There are different variances you can do to make this option personal. 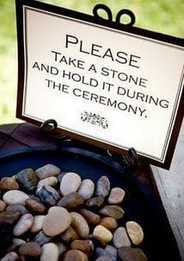 Your guests are given a stone at the beginning of the ceremony. ~They can be handed out by the Ushers or important family members (think girls a little too old to be a flower girl). ~They could be placed on the guest chairs with an information card. ~They can be on a table at the back of the ceremony by the programs. ~ perhaps kept in little buckets at the end of each aisle. The guests are asked during the ceremony to take a moment to hold their stones and add their best wishes and blessings for your marriage. They are also told that after the ceremony they should toss their stones in the water or in a collection vase to display in your home. At the conclusion of the ceremony, you and the wedding party toss your stones and your guests to follow. P.S. It makes a great photo if your photographer catches you and the wedding party tossing your stones at the same time.